“Take a deep breath”—the answer to angst from moms to gurus. We were sitting in my office and the young premedical student in front of me was reaching for another tissue, shoulders heaving. I was comforting her, but my mind caught on her comment. Me? Calm? Sure I saw it as 99% veneer, but somehow there was an eye to my storm and for a second her comment caused me to see it. There have been a few of those moments in my life—so fleeting I doubt their existence a few minutes later, but I long to hold on to them and so they go. But what has this to do with Lama Surya and the Joshua Tree retreat? I must go back further. My background is in good, solid, prove-or-disprove-the hypothesis science, but there has always been a longing for spirituality. As a young women I equated that with religion and to test its validity on its own grounds, I spent my senior year in high school studying Catholicism. The next two years were Judaism, Hillel, kosher, –until I was served a big piece of ham (shudder) by my future father in law and religion went on the backburner. Life: Divorce, my first husband’s death in a speedboat race, second marriage, children, the Bahai Faith for almost 30 years, my husband’s Parkinson’s, empty nest, grandchildren. Becoming older, death of a young nephew and his bride in a head-on collision, of my father to pancreatic cancer, of my stepfather in 20 days from H1N1, and now I face my 90 year old mother’s Alzheimer’s. Our tragedies come to each of us, life and age bring them, and they are only slightly different flavors. Still we yearn. After my husband’s diagnosis, I began going to Zen Centers and meditating. It was good. That initial sort of awakening hooks you in. I began to read Buddhist books and found one by Lama Surya at a new age shop in Encinitas. Then I learned he was coming to a signing and I showed up. I gave my email to someone and when I learned folks were meeting in Vista, I took a chance and showed up. The people were beautiful, we sat on a lovely outdoor veranda overlooking a garden, and chanted. When I learned the Joshua Tree retreat would occur during my spring break, I accepted serendipity and drove through the hills and windy passes full of turbines, past a snow covered mountain and into a silent world of desert beauty, early morning chanting, communing with a jay at breakfast while she ate almonds out of my hand, luxuriating in real vegetarian food. 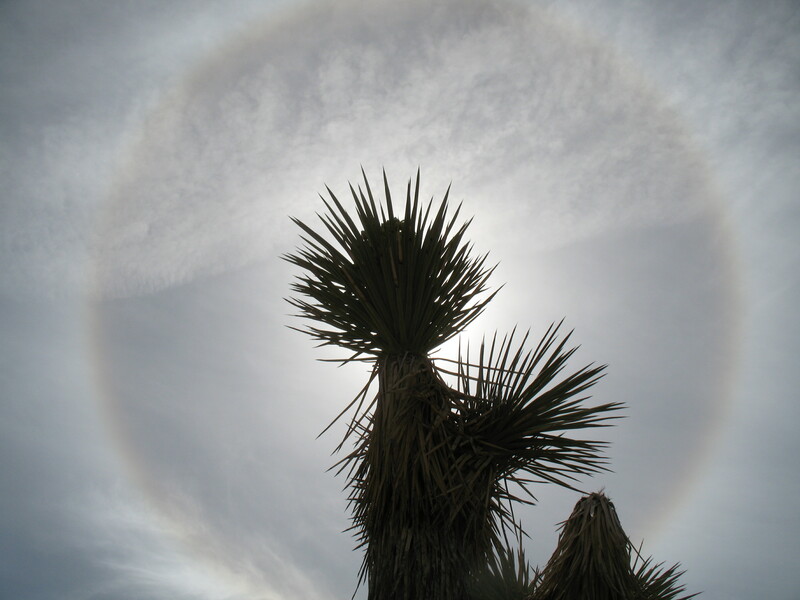 One morning, after chanting and a talk by Lama Surya, I walked out to observe a circle around the sun. Others seemed to take no notice; I took pictures and felt honored. Another time in a guided meditation, my mind slipped off the edge. Later, perhaps nanoseconds, perhaps because my mind needed to make sense of what can’t be described, I envisioned myself a giant Buddha statue, crumbling as I bent over me as I meditated below. Afternoon walks in the desert brought different sensations as I found a desert baked Gila Monster, cruelly riddled with bullets—strange rocks, birds, Joshua trees in full bloom, washes with the detritus of car seats and cook pots. Climbs in futile search for an elusive vortex led to vigorous walks to get back for afternoon sitting. The next year I took off a week when it didn’t jibe with vacation. There is always change. As care-giving responsibilities increase, the economy suffers, the need to make plans or find funds may keep me away. I don’t know, yet. I take a deep breath. Spiritual tourist, spiritual Pop-Eye, truth or self-illusion– I don’t know. There are places that are special. Joshua Tree is one of them. Perhaps it is also in the eye of my storm.